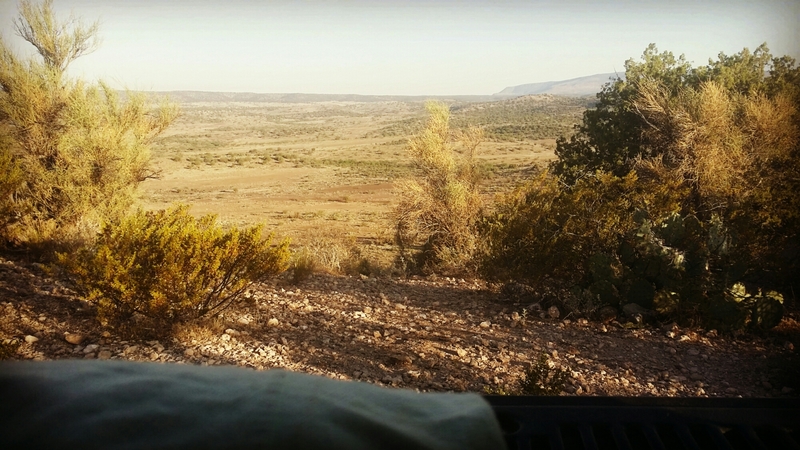 This is the view from my pillow, right now (7:15 this morning), at the top of a small hill above Cottonwood, overlooking the open plain between the edge of the Colorado Plateau and the Verde River. Taken to the sound of gun shots below. I’m camped right above a shooting range. Toto, I’ve a feeling we’re not in Sedona anymore. I meant to leave. I needed a different color. Living in the red does something to my soul. Maybe the iron in the rocks seeps through my feet into my blood stream, maybe the omnipresence of 450 hz (the vibration of red) activates my root Chakra. By whichever school of thoughts, it affects me. Feelings, like sunsets, are never pastel in Sedona. Sadness tastes like despair. Unchecked unconscious annoyance can turn to rage. Joy feels like Universal Love and Gratitude bursting out of the heart and every pore. Oh, most delicious of feelings! That last one’s a bit addictive. And it’s not just me. Every guest I had on tour this week commented on this. One woman had uncontrollable anger, hated her hotel and everybody in it on her first night. By the time I met her, the next day, she glowed brighter than an Angel of Love. Another cried massive emotional release, then said she felt more energized than she’d ever felt, and all I did was take her to the Creek. Yep! Sounds like Sedona. Whenever I leave the red rocks, I get depressed for a day. It took me a while to make the correlation. I just thought Flagstaff was a sad place, then I realized I felt the drop in energy regardless of my destination away from here. I don’t come to heal (that I know of). I come because I love feeling intense for a little while. It’s like my natural growth gets sling shot to the next level. And also, it’s gorgeous, I can work as a guide guide and live for free in the postcard. I have a few friends who live in Sedona full time and are perfectly grounded and operate at a “normal” level. I also have several who probably should have left decades prior, when they still could. Like all things, it’s what you make of it. For me, I can’t stay in the sling shot full time. After a few months, it makes me crazy (er?). When I get that buzz, it’s time to go. And that time is now. I’m buzzing. Emotions run high and I might compromise friendships or expand energy solving imaginary problems if I linger. In addition, summer’s here and it’s hotter than hell by 7 am. My face feels like it’s about to crack from dryness. I don’t have AC – I’m not sure I’d want it. It’d only make the outside feel hotter. Yesterday, the Tupperware I left in my front seat, in the shade, melted into a malformed mass, and right now (7:44 am) the glue that holds the velcro on my truck’s curtains is failing, leaving me exposed to the ball of fire at the heart of the great desert oven. I have a few more tours lined up for June, but I’m already packed. Last month I left “for a few years” on the new moon, and returned two weeks later on the full moon. In the 3D world it all made sense. There was work here and I needed funds. But in Sedona-speak, the moon probably did it. This time I’m leaving on the full moon. I hope it sticks. I’m migrating north to greener grounds, meadows and snow capped mountains. It is time. This entry was posted in 2016, Roaming, Truck Camping, written in sedona by the Roaming Bobcat. Bookmark the permalink. Yes, it’s time to leave before your tires melt! And, that has happened to me! Happy travels Bobcat! Run Bobcat run, it’s a vortex.